This is the last item that Atlas will be sending me in this collection., and I suspect probably one of the last shipments they make before being closed by DeAgostini. Regretably DeAgostini has decided that Atlas should close the collection down before all the models featured on the introductory material have been shipped, notably the Ford Galaxie 500 and Mercedes-Benz 230SL. I have asked Atlas Customer Services to refer my query as to why they have failed to ship these when DeAgostini is selling them in boxes marked Atlas on their Model Space web site. As yet I have had no answer and I am not holding my breath! 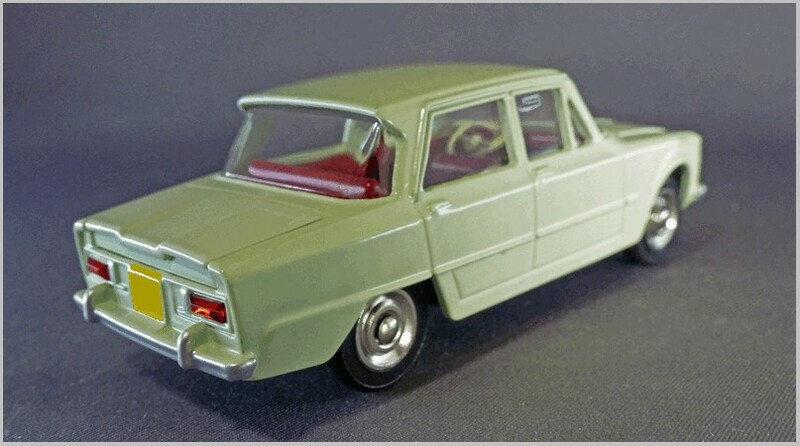 After a run of late French Dinky Models we get a classic from the 1960’s. 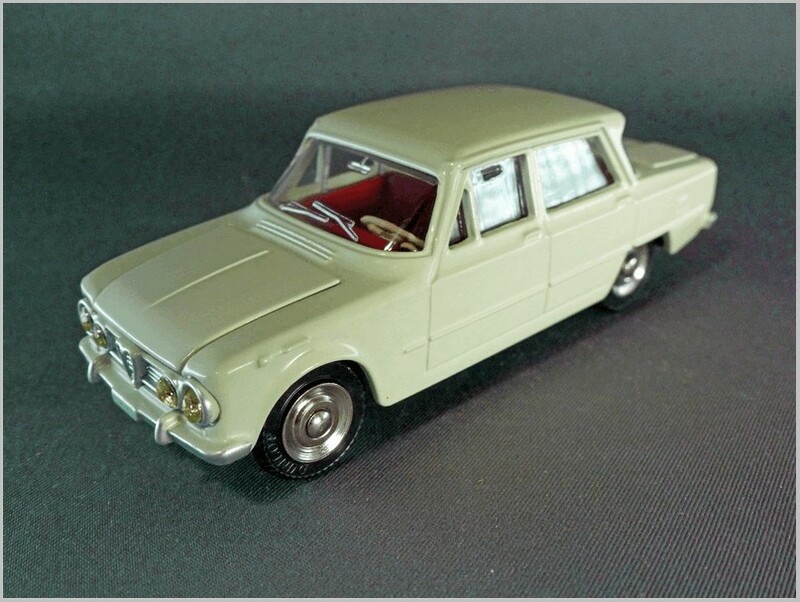 Introduced in 1966 #514 Alfa Romeo Giulia 1600 TI was given a lovely reproduction box with signed artwork. It was marked 1:43 scale on the base. This casting was later re-numbered 1401 and given rally markings. The box is a lovely period piece at a time when those that could afford an Alfa Romeo in France wore hats, even when heading for a lovely seaside location. 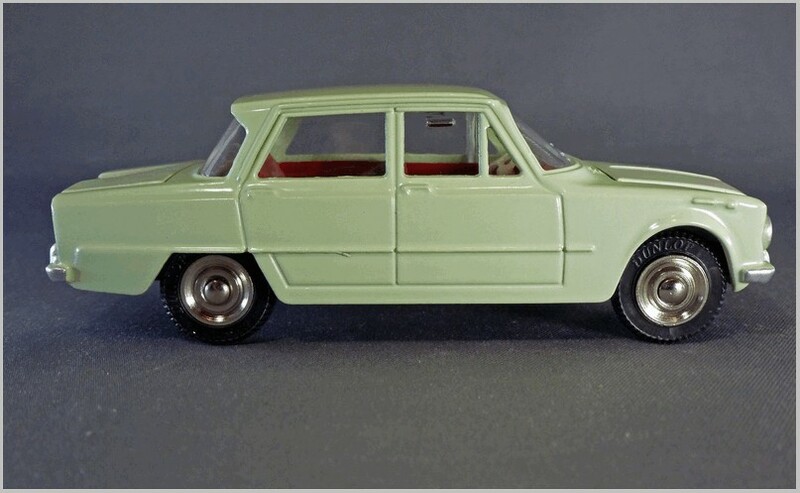 The original Dinky model was recently covered in Robin Godwin’s fascinating series comparing all the contemporary Giulia models, and the part covering the French Dinky may be seen here. 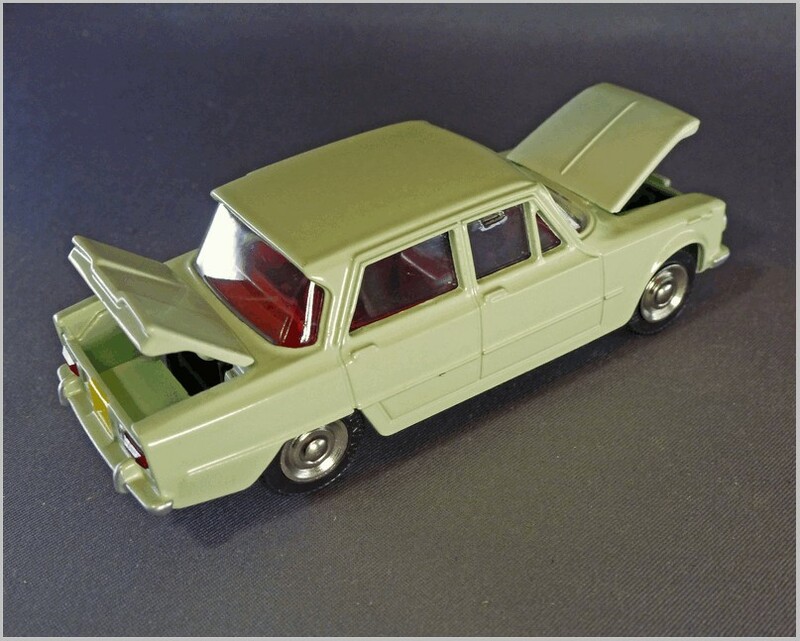 Robin’s review suggests that the model from French Dinky was amongst the best contemporary models of the Giulia but points out that there were a number of moulding faults on his original that Atlas has chosen not to replicate. The Giulia TI was the first car introduced in the Type 105 range. It was fitted with a mildly tuned version of the 1,570cc twin cam engine. As the TI Super and the Super were introduced it became the base model in the range. Early cars had all drums and these were replaced early in production by Dunlop disks all round. With a bench front seat it was marketed as a six seater but in truth four adults was the comfortable maximum. The TI production was brought to an end in 1967 when the 1600S was introduced as the new base model. Here Atlas has modelled it in a very pale green but all my reference books say that it was produced in white, silver and grey. 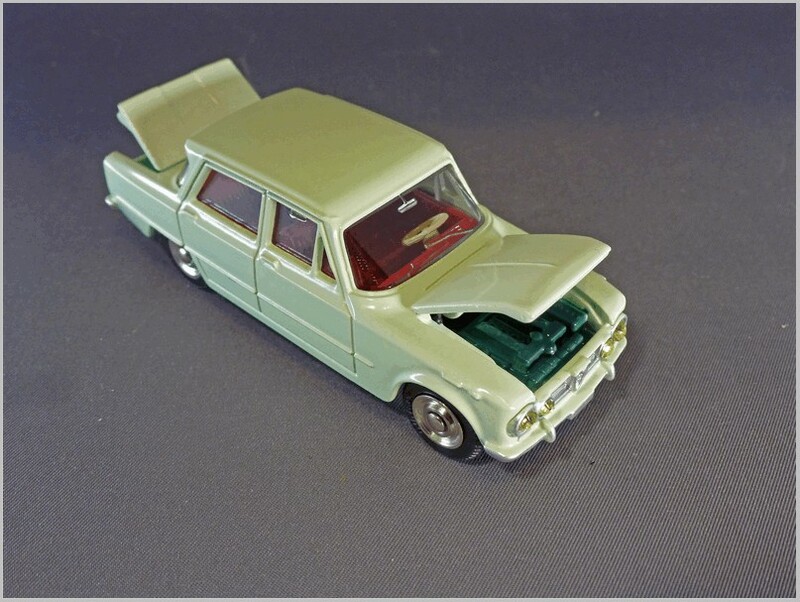 Does any reader know if this pale green was actually used by French Dinky? The mode captures the real car well with the distinctive peaked rear window nicely modelled. And a neatly modelled grille. The front lights are ‘gems’ and the rear lights are small plastic inserts. The front windows slide up and down with a small protrusion to help. Spaces for the number plates exist and a yellow square is shown to the rear. On the side the rubbing strip and side indicators and door handles are moulded in but not highlighted. The opening parts are boot and bonnet as shown above. An engine bay moulding is part of the main shell and painted dark green rather than the rather less realistic silver often used for contemporary models. The tyres are as usual for French Dinky, nice mouldings with Dunlop embossed. The wheels are simple polished discs, again as generally used by French Dinky. Well that appears to be the end of models being sent by Atlas and the list below shows the models that I have received. I believe that I have received a compete set but if any reader has received any additional models from Atlas then please let me know at maronlineeditor@gmail.com. As there area number of models available which should, or could, have been in the Deluxe DInky collection I will cover those in future articles.